Preheat oven to 350°F. Spray two 7” baking pans with nonstick spray. In a large bowl or stand mixer, beat together cake mix with eggs, beer and vegetable oil until smooth. Pour batter evenly between the two prepared pans. Bake for 29-35 minutes, or until center of each cake springs back when touched lightly. Remove and cool completely. 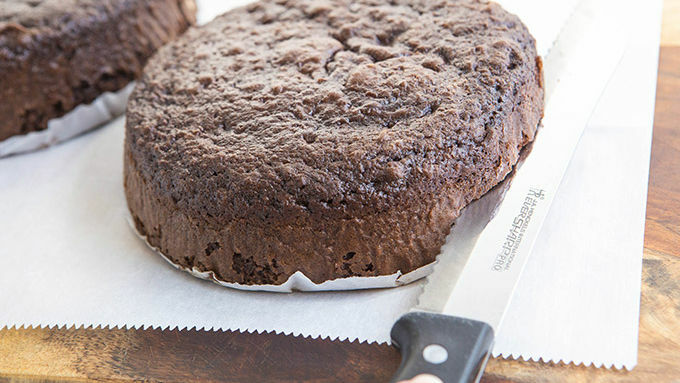 Once cool, use a large serrated knife to slice cakes in half, creating four cake rounds. In a stand mixer, cream butter until soft and fluffy. Slowly beat in confectioners' sugar, about 1/2 cup at a time. Add 1 tablespoon coffee creamer, mixing until smooth. Gently fold the marshmallow creme into frosting until thoroughly incorporated. Spoon all but 1 1/2 cups of frosting into two large icing bags. Add cocoa powder and remaining two tablespoons of coffee creamer to the bowl and beat until smooth. Place one cake round on a cake stand. Spread half of the chocolate frosting on top. Top with a second cake round, spread a small amount of white frosting between the next layers, then chocolate between the final layers. Frost around the top and sides of the cake with the marshmallow buttercream. 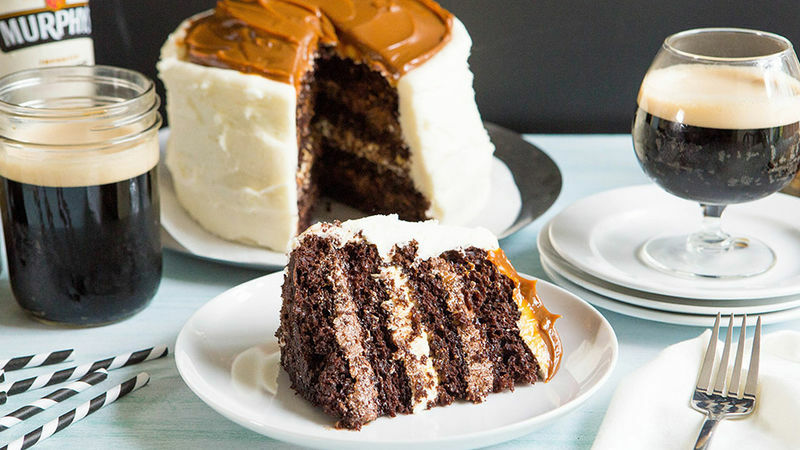 Spread dulce de leche on the top of the cake. Refrigerate for 1-2 hours before slicing and serving. The only thing better than a slice of this cake? Enjoying it with a cold glass of your favorite beer! 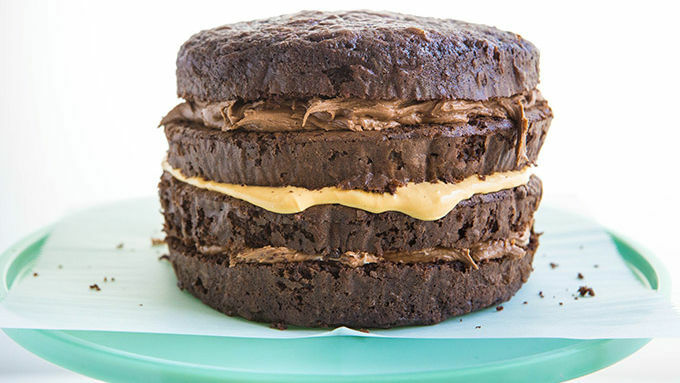 Everything that’s good in life, baked into a cake. Sometimes flavor combos are so wickedly brilliant, it feels like you’ve come home when you conjure them up. It’s not unlike that song about the place where everybody knows your name. Know the song? Been stuck in my head all day. Because I started thinking about the perfect trifecta of flavors: stout, marshmallow, and caramel. And then I thunk about making a cake. And then I was like, “How has nobody ever made this cake, because those three flavors would basically be like Sam, Diane and Rebecca.” (Way too many midnights watching Cheers.) Which got me singing the theme song about everyone knowing your name and Googling “Where is Ted Danson now?” while making this perfect cake. And now I’m totally off track. But can you blame me? 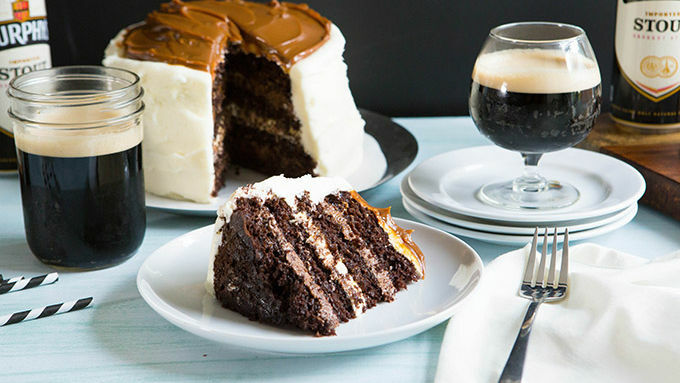 Chocolate Stout Cake. With Caramel Marshmallow Cream Frosting. This, friends, is the sort of thing that derails a long story. It’s also the sort of thing that tastes like friendship. In your favorite pub. Turned into a cake. Long story short: Make this cake. You will love. It all starts here, with cake and beer. And if that doesn’t sound like a pub ballad waiting to be written, let me promise you: It is a pub pastry waiting to be tasted. I found the easiest way to work with the marshmallow fluff frosting was to pipe it on in giant, swoopy rounds, then smooth with a knife. If you have an icing spatula, even better. A merry scoop of the canned caramel is absolutely bliss perfection. And if you’ve never tasted bliss perfection, just ogle this instead. And try not to weep tears of gladness for hundred years. Grab your stout cans. Let us raise them high to the finest cake this side of the country. Sing the loud songs. Raise your forks in boisterous biddings. Or whatever you’re supposed to say when you’re about to eat stout cake with your pubmates. And then, prepare to shovel forkfuls of booze-spiked pastry into your face. Aye, cake. How we love thee. And on that note, peace out pub lovers—we’ve got us some cake to eat. Cheers!